The state of Rwanda's economy explained in 4 simple graphs. Earlier this month, the World Bank hosted a presentation of its 8th Rwanda Economic Update. The presentation was given by Yoicho Ishihara, senior economist at the Bank, and Gunhild Berg, the financial sector specialist, was about the strategic role of the financial sector in supporting Rwanda’s development. Insightful and well-documented, this update was also timely as Atlas Mara, the financial venture founded by ex-Barclays chief executive Bob Diamond, has the ambition to be Rwanda’s biggest bank in terms of the number of branches. The bank is currently in discussions with the Government of Rwanda to privatise the Bank Rwandaise de Developpement, which has been Rwanda’s publicly financed development bank for more than four decades. However, it is not development finance that we found the most interesting in this presentation, but the concise and graphical way in which the World Bank researchers summarised the state of Rwanda’s economy. 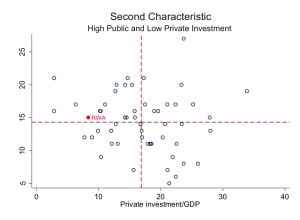 They presented four graphs that we reproduced here with publicly available data and which, in our opinion, capture the most important features of Rwanda’s economy: a country with (i) high growth and low income, (ii) high public and low private investment, (iii) low exports and (iv) high aid inflows. Rwanda has been experiencing stellar rates of growth for the past decade, averaging 7.6% per year from 2004 to 2014. It is indeed one of the fastest growing economies in Africa and in the world. Its stable political and business environments, attractiveness for investors and international donors and the dynamism of key sectors like export-oriented agriculture and tourism are all contributing to Rwanda’s impressive recent economic record. But Rwanda remains a low-income country, whose income per capita per year stands at 652 US$ only. The government’s ambition is to turn the country into a middle-income country by 2020, to do so it must manage to increase GDP per capita by 393 US$ in 5 years. 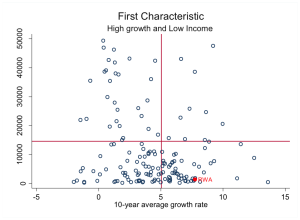 Rwanda is a low income, but high growth country; the graph below summarises these characteristics. An important factor of Rwanda’s high growth is the high level of public expenditures. While the government sees in the private sector a motor of Rwanda’s development in the near future, the latter still lags behind the government in terms of investment capacity. Government expenditures account for 15% of the national income while private investment has been stable at 8%, below the average of countries for which data is available: 14%. 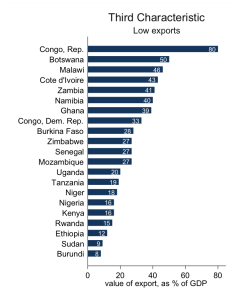 Thirdly, Rwanda is less reliant on exports than other African countries. The value of its exports in 2013 totalled 15% of the national income, below the levels of all its East African neighbours, except Burundi (Kenya, Uganda and Tanzania). Rwanda’s exports are concentrated in two sectors: minerals and petroleum (metals and refined oil) and agriculture (tea and coffee). All these accounted for almost three-fourth of Rwanda’s exports in 2013. The bar chart below represents Rwanda’s export value in 2013 as a share of national income, along with those of selected African countries. Finally, Rwanda is a big recipient of international aid. In 2013, Official Development Assistance (ODA) represented 14% of GDP, more than Tanzania (8%), Uganda (7%) and Kenya (6%) but less than Burundi (20%). 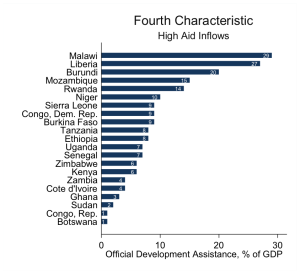 Because international aid is a central component of the Government of Rwanda’s annual budget (typically between 30 and 40%), the fluctuations in aid inflows can have serious consequences for the national economy. For instance, following an aid shortfall in 2012, economic growth decelerated from 8.8% to 4.7%. The chart below represents the share of ODA in 2013 GDP for selected African countries. In sum, Rwanda is an economy characterised by low income but high and sustained economic growth, public investments are still much bigger than private ones, the level of exports is low and the country receives large amounts of international aid. While Rwanda’s economic development is a complex process with many more aspects than can be discussed here, these four graphs offer a quick introduction to Rwanda’s most important economic features.